As our office technologies continue to evolve, our skill sets must also evolve with the times - and medical offices are no exception! Gone are the days of appointment books. As medical offices become increasingly integrated with patient and medical files, Medical Office Assistants must adapt to using scheduling software that can not only keep track of appointments but also track patient billing and perform documentation integration. There are many software programs that assist in the medical transcription process - even turning doctor notes and patients files into electronic formats for easy access and storage. Part of the job of a Medical Office Assistant is to perform medical billing and basic accounting. As a Medical Office Assistant, you will need to know your way around computerized accounting software that will allow you to perform private and third party billing, create invoices and reimbursements. The Robertson College Medical Office Assistant program provides the training you need to excel in today's medical office settings. 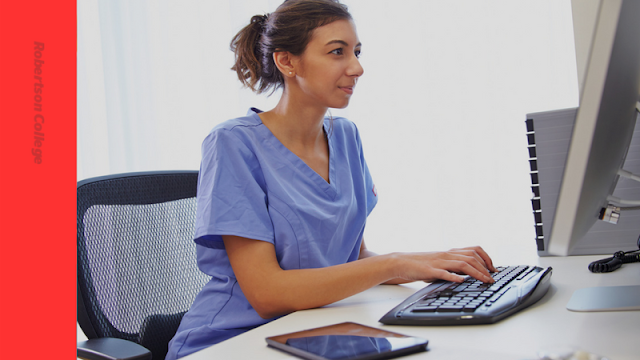 From medical transcription and understanding medical terminology to basic training in accounting software and clinical procedures, the program will provide the foundation you need to launch your career. If you are interested in learning more about this program or want to know more about financial options, contact us to get started.